The Tesla Roadster has a cool feature that allows you to set the time of day when charging should begin. I have mine set to 10PM which I thought was off peak. I decided to check the actual rate schedule. It turns out it's a bit complicated. (See the definition below.) Most of the time 10PM would be Partial-Peak. Of course there is no reason to charge the car at Partial-Peak instead of Off-Peak. It almost never takes more than 4 hours to fully charge the Tesla. So I'm changing my charge time from 10PM to 2AM. 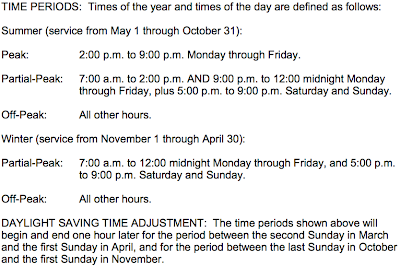 Off-Peak starts at midnight most days but there are a few weeks per year when it starts at 1AM. I'm going with 2AM just to be safe. The earliest the rates go up is at 7AM, and then it's just to Partial-Peak anyway. This safely gives me 5 hours of Off-Peak charge time, which is plenty. It's interesting how all these rules are setup as incentives but they are so complicated that most people don't even bother to try to understand them at all. Click on the above image to see the entire rate description document in PDF form. Note this is for my rate schedule, E-9. It's special because I have solar panels and an electric car.